How a 2.5-hour podcast interview stretched me (in a good way), and the other ways in which I (and you) might want to step out from the comfort zone and into the growth zone. You can browse all episodes here. The many ways in which being a podcast guest took me out of my comfort zone. The podcast I was a guest on: The George Mihaly Show. The story of how George and I met (it’s a good one!). Another podcast I was a guest on recently: Inside Personal Growth. The ways in which my conversation with George was outside of my comfort zone: putting my face on camera, live-streaming the conversation, the sheer length of it, and the broad (and at times, personal) topics that were explored. Looking more broadly at where and how you might step outside of your comfort zone because of the growth that lives on the other side of it. 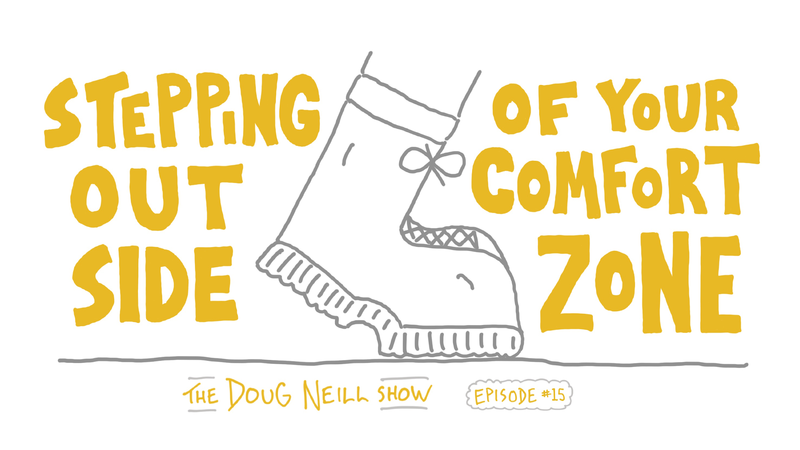 I explored the idea of a comfort zone, growth zone, and danger zone in my online course Learn In Public, which was informed largely by my experience documenting the growth of my sketchnoting skills at The Graphic Recorder. The three projects that I explore through the lens of the comfort, growth, and danger zones: Verbal To Visual, this podcast, and a future writing project. What lives in your comfort, growth, and danger zones? How might you hop into your growth zone from time to time? What a PDF visual summary and template connected to this episode? That’s now a perk for those supporting the show on Patreon. Come join us over there! Thanks for listening, and talk to you again next week.